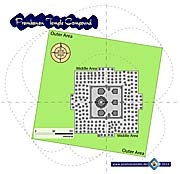 For a 'Map of Prambanan Archeological Park' click the link or on the image. Sketch of the inner, 'Main temple area of Prambanan'. Click the link or the image itself to get the map. 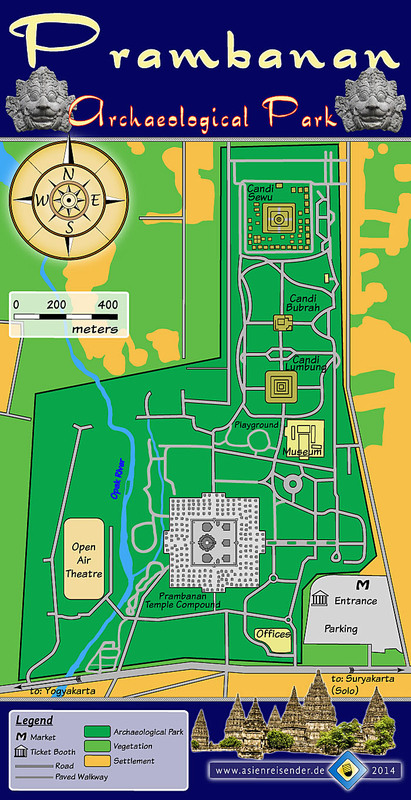 A visualization of the 'Architectonical concept of Prambanan Temple Complex'. Click the link of the image to get the map. Candi Vishnu, the northernmost of the three main temples. Angsa (Hamsa) Temple, opposite to Candi Brahma. Candi Nandi, where Shiva's vehicle, the bull Nandi, is placed. 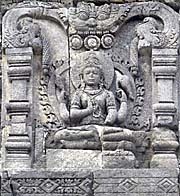 Vishnu, in the northern main temple of Prambanan. The inner chamber of a hindu temple is the most sacred place of the sanctuary. It's called the 'garbhagriha', Sanskrit for 'womb chamber' (garbha = womb, griha = house). In the garbhagriha are the religious idols placed. In the case of the three main temples of Prambanan it's the Shiva, Vishnu and Brahma statues. Entrance to the garbhagriha is given through a single door. Inside it's usually pretty dark; there are no windows, but sometimes candles burning, together with incense. Although garbhagriha are classical for hindu temples, they appear also in buddhist temples. Usually access is restricted to certain priests. In touristic attractions, who are no more in use as sanctuaries, everybody has opportunity to have a look. However, not seldom one sees people having a prayer, burning insence or offering something for the deities. 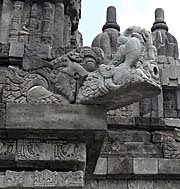 A gargoyle at one of the main temples of the inner compound. Skillfully made as one of many daemon guards of the temple, it's part of the drainage system to prevent water damage from the building. Gargoyles of the Prambanan temples. Not only in rainy season they have to cope with a great deal of tropical rain. One of the many daemon faces of a spirit who cares for the temple and protects it against unwelcomed intruders. A spirit, relative small, accompanying the daemon's face above. Flower ornamentic at Prambanan's temples. A young man in the frescos of Prambanan. According to his simple dressing he is neither god nor nobleman. His hairstyle is that of a commoner. Someone female much higher in rank than the chap above. 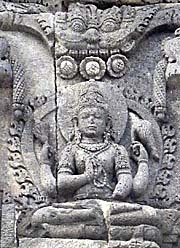 A deity in the reliefs of Prambanan. The firering in the background seems to indicate Shiva. 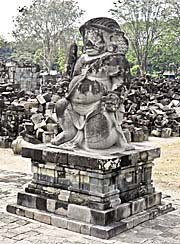 A lion, bedecking the outer side of the stairway to Candi Brahma. Another piece of a very filigrane work. Kinaras under a jewelry tree. An often seen image in hindu temples. Kinaras are chimeras of humans and animals. 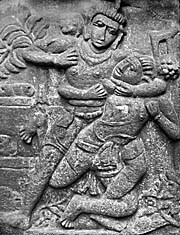 Prambanan's bas reliefs show also, in difference to Borobodur's frescos, some fighting scenes. Crenellations of Prambanan, appearing in a great number. One of the stone guards at the entrances of Candi Sewu temple compound. There were originally eight of these guards posted, two at every entrance gate to the temple ground. A shrine next to Candi Lumbung. Most of this smaller temple complex is broken. 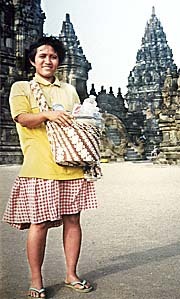 A saleswoman in Prambanan Archaeological Park. It seems meanwhile it's prohibited for salespeople to go there; in 2012 there wasn't a single one. Therefore there are many foodstalls and souvenir shops in the entrance area, and the folks there acts pretty aggressive to gain customers. A big problem is littering; Orientals drop their rubbish wherever they are. Worse are the industries, who wrap their consumer crap exclusively in one-way packagings. Indonesians, having a picknick in the middle area of the temple complex. Candi Sewu, inmiddle of the surrounding debris. The image top right shows one of the reliefs of the sight. It's defenitely one of the gods, might be Shiva himself. In his left hand he holds a lotus flower. 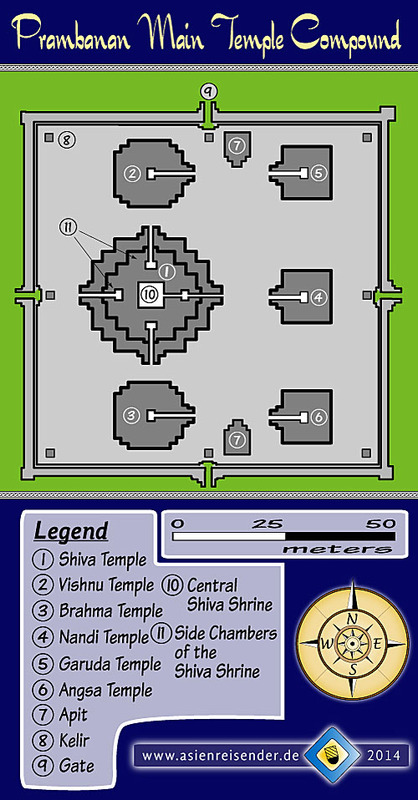 The image bottom left shows the Brahma statue in the chamber of the temple right hand to the main Shiva monument. The sight of Prambanan is a huge collection of alltogether 240 medieval hindu temples, of whom the most are totally ruined. Prambanan must have been an extensive temple city, comparable to the sacral temple city on the not so far away Dieng Plateau. The Prambanan temple complex was built from 850 CE on. It's supposed that it was the respond of the hindu Sanjaya dynasty to the errection of the magnificient, very impressive monument of Borobodur, some 80km away from Prambanan. Not only Prambanan's size, but much more the high quality of it's architecture and arts make it one of the very significant historical sights of Southeast Asia. 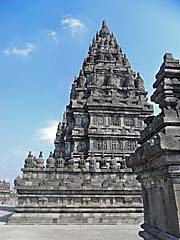 The main temple, which is dedicated to the main hindu god Shiva, is also called Candi Rara Jonggrang. Rara Jonggrang, the main (Shiva) temple of the inner group. At the last time of my visit in May 2012 the Shiva temple was closed and fenced. The aftermath of the 2006 earthquake still lasts and the building could drop parts of it. The massive monument has an impressive height of 47 meters. Hinduist Prambanan appears on the first glance very different from Borobodur. It consists of a number of high, towerlike buildings. The eight main temples are placed on a central, slightly elevated platform. The tallest central Shiva temple Candi Rara Jonggrang is with a considerable height of 47m a bit higher than the stepped pyramid Borobodur. Around the central platform, in a middle area, were 244 more temple buildings aligned; most of them are merely reduced to heaps of debris. Natural disasters and the (ab-)use of the blocks as building material over ages made them lost for archeology. Only buildings of who at least 75% of the substance is still there are getting rebuilt. Candi Brahma, much smaller than the central Shiva shrine, but still huge. However, these hindu sanctuaries always look somewhat sinister. Buddhist Borobodur temple, in compare, is one massive monumental building, including a microcosmos of buddhism and more ideas shown in it's six kilometer long relief galleries. On the second glance one can see that the kind of architecture and reliefs shown in both sites are somewhat related to each other. Since the distance between the both sites is not big (less than 80 kilometers) and the royal families behind the two building complexes where in relationship with each other, one can suppose that some of the skillfull constructors and artisans of Prambanan respectively older family members were formerly busy at Borobodur as well. The origin of the name 'Prambanan' is not fully clear. Prambanan is the name of the village, where the temples are. It might be a derivation of the hindu god's name Brahma. Might be that the original name of what we know as Prambanan Temple Complex was 'Shivagrha'. It's not easy to understand the medieval history of Java, because of the lack of original sources. There are no written records who survived the tropical climate over the centuries. The only written sources are the few, meagre stone inscriptions in the monuments itself. Much of the history remains object of speculation, and it's difficult to get usable literature about it. The representative sites like Prambanan, Borobodur, Dieng Plateau and their museums themselves also offer only poor background information. Some of the guides who sell their services got a training, but have usually no real deeper understanding nor any passion for their topics. Guide is merely a job as any other, like becak driver or salesman. 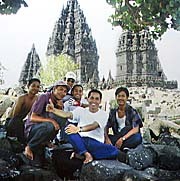 Prambanan's main temple group. In the foreground are some of the remains of 224 totally destroyed smaller temples of the 'middle area'. Well, there are two exceptions of fully restorated ones. Besides there are long-term plans to restorate the others as well. In their original state these temples of the middle area were aligned in a strict geometrical order. There is a stone wall as a border separating the two inner areas from each other. In May 2006 happened another of the not seldom desastrous earthquakes in central Java. The site of Prambanan got heavily affected. The central Shiva temple was still closed in 2012 due to the damage. It has what of a Sisyphean labour to so nicely reconstruct all these artificial monuments just to see them getting damaged by the next, unavoidable earthquake sooner or later again. The inner, central temple area. It's the most sacred, important and representative part of the sight; most of the restoration efforts concentrated on it. However, there is further restoration planned for the middle area as well. Besides, Candi Sewu and the two smaller buddhist temples within the archeological park got also some restoration. The grand temple city of Prambanan was built from 850 CE on. The building phase stretched probably, as it was also the case with nearby Borobodur, over a few decades. The ruling kings of the time were king Pikatan and his successor king Balitung. The Archaeological Park of Prambanan is of a considerable size. One has to walk several kilometers to come around here. For those with foot-aches there is a small trainlike vehicle with a kind of [electrical] locomotive and some cars for passengers. It's commuting between the park entrance and the various sights in the park, until the very north of it, Candi Sewu. Within the archaeological park, west of the Prambanan temple compound and across the Opak River is an open-air theatre, a larger stage for promoting the Ramayana epos at night. The site of Prambanan is divided into three different zones. Although Prambanan is, in difference to Borobodur, a hindu sanctuary, it's following partially similar concepts. One of them is the purity of spirituality. The pilgrimage from bottom to top of Borobodur is a spiritual voyage from the primitive, earthy being to a purified, spiritual being of enlightenment. Although enlightenment plays no role in hinduism, the concept of Prambanan is also following the ideal of spiritual purification. 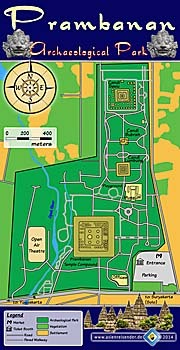 The outer area is for 'normal' beings with all their failures, the middle section is already for advanced beings with a considerable spirituality, while the inner, central platform is exclusively for the highest spirits, the gods, the high priests, the king and his family, ministers and inner circles. 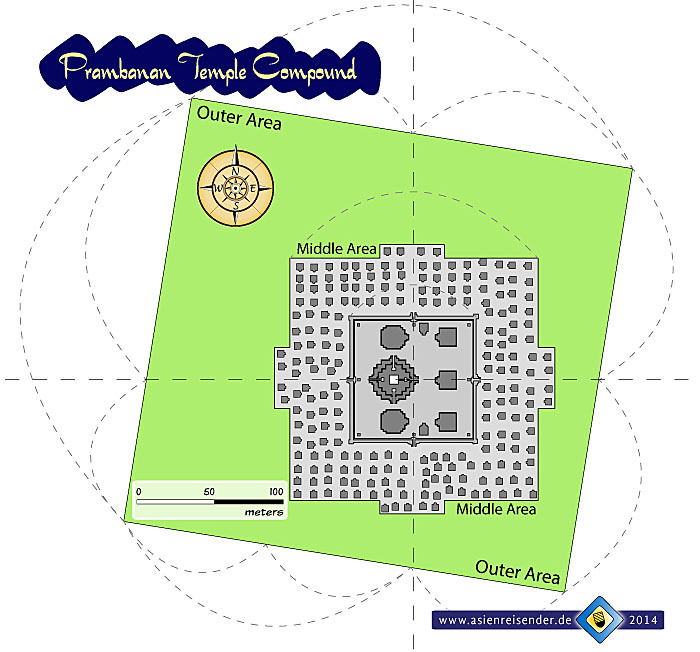 The three areas of Prambanan Temple Compound. Remarkably, the outer area is, although squareshaped as the two inner areas, aligned in a different angle. Since there are no buildings in the outer area left, the outer area as such doesn't exist anymore. Prambanan Archeological Park is an area of a considerable size. Best to explore it is, as always, by walking. Therefore one should take his/her time. It's defenitely worth to come here more than one time, because there is so much to explore that it's too exhausting for one visit. Besides it's always a pleasure to see such great sights in different lights and weathers. Beside of Prambanan Temple Compound itself there are three other temple sites in the Archeological Park. The largest is buddhist Candi Sewu, older than Prambanan and also a big temple compound, which originally consisted of hundreds of temples. Candi Lumbung and Candi Bubrah are smaller and both in a comparable poor state of restoration. Interestingly, it seems that the Opak River has been altered in his course by the builders of the monuments. 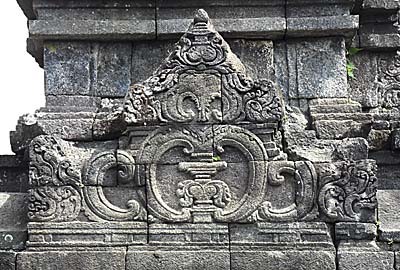 A waterwork project has been mentioned on the Shivagrha inscription, where Prambanan is described. Originally, the river run more eastward, close along the temple compound. The park is enclosed by a fence of about 1.90m height. The entrance fee in the mid 1990s was very low, but rose massively in the meantime; in May 2012 it was 15 US$ for a foreigner, for Indonesians merely a part of it. 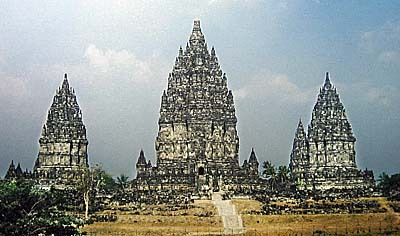 The central part or platform of Prambanan was the most sacred part of the compound. It's assemblage consists of eight bigger temples. Here one sees the levelling approach to the inner square. A huge amount of foundation material must have been transported to the site to shape this landscape. The tall building is, of course, Candi Shiva again. 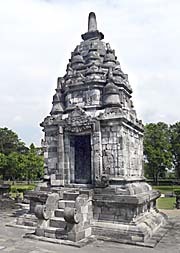 The three main temples, Trisakti, are built in an exact north-south alignment. The central main temple, Candi Rara Jonggrang, was dedicated to Shiva, the inventor of new things, but also a great destroyer (maybe according to neighbouring Mount Merapi, who destroys frequently surrounding lands but creates and feeds new life due to his fertile volcanic ashes). The impressing height of the main monument is 47m with a square base of 35m each side. Candi Rara Jonggrang is ornamented with a number of reliefs who show episodes of the hindu epic Ramayana. In the main chamber is a statue of Shiva placed, in four smaller sidechambers are statues of Shiva's wife Durga, Shivas teacher Agastya and Shiva's son, the elephant god Ganesha. Deep inside the Shiva temple there was an urn found together with quite a variety of funeral adjuncts. The entrance to one of the side chambers of the Shiva temple Rara Jonggrang. In 2012 access was denied due to danger of (partial) collapse, an aftermath of the 2006 earthquake. North of Rara Jonggrang stands the Vishnu temple. Although it's clearly smaller than the main temple it's still of an impressive height of 34m and a base square of 19m each side. There is only one chamber inside where a statue of Vishnu is erected. A sequence of bas-reliefs on Vishnu temple depict the story of lord Krishna from the Bhagavata Purana epos. The southern one of the three main temples is that of Brahma, the creator. He is of the same size as the Vishnu temple and houses as well a single statue, and you won't guess it, it's Brahma himself. 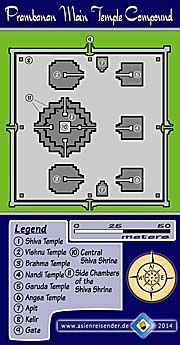 These main temples are placed on the central platform, together with three more, but smaller secondary temples. This main platform is square-shaped and each of it's sides is 222 meters long. One approaches it by climbing some steps up, entering one of four gates. Only the northern gate is restorated, the other three gates are broken. At the wall of the eastern gate more reliefs, who depict the Ramayana epos, start and span all around the inner area. The relief panels have to be read in a clockwise direction. The three 'secondary' temples opposite the main temples who are dedicated to the three central hindu gods, serve as shrines for the gods vehicles. Nandi temple, opposite the Shiva temple Rara Jonggrang is the housing for Vahana, the devine bull. 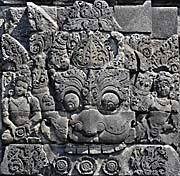 Vahana appears in company with two more deities in Candi Nandi, that's Chandra and Surya. The temple opposite to the Vishnu temple was probably housing a garuda, but it's empty now. Generations of tomb raiders took out what they wanted. The vehicle of Brahma is Angsa (also: Hamsa), a swan who appears also often in hindu and buddhist temples. Certainly in the shrine of the temple opposite to Brahma there was once a statue of Angsa/Hamsa placed, but now it's empty as well. The central platform or inner area is the most sacred part of the whole temple compound. To mark it's importance it's surrounded by a wall with the mentioned four gates. It's the gods habitate, and only exclusive, privileged members of the medieval Prambanan society were supposedly allowed to enter it. Additionally it was certainly a highly ritualized event to visit the divine platform. Prambanan, approaching the main platform from the north. The northern gate is the only of the four gates which is restorated. The main temples at the right side are the Vishnu and Shiva temples; the Brahma temple is covered behind the main one. Left side one sees the complementary temples for the gods mystical animal vehicles. The main platform as the center of the whole complex is surrounded by a middle part, where in former times 224 temples of smaller sizes were built in four rows. These shrines were made in an identical style. Row for row, approaching the inner area, are slightly elevated. Since hinduism is a strict caste system, it's possible that the four different elevations reflect the hindu casts. The temples of the middle area are called Candi Perwara, what means somewhat like guardian temples. Now there are merely stone heaps where once the buildings were. Only two of them are reconstructed, while the remains of all the others are tidily piled up at their places. The middle area was the space for askets and lower gods. Hinduism is so very, very rich in different gods; many of the smaller gods are local gods who don't appear elsewhere in the hindu world. It's thinkable that in the heyday of Prambanan the middle area with all the smaller monuments was partially inhabited by Brahmans. 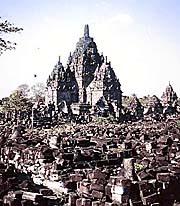 The middle part of Prambanan Temple Compound, as it looks now, after numerous earthquakes. Merely debris is left. At least two of the 224 monuments of the middle area are reconstructed. One of them is to see in the left picture, left edge. Images and photocomposition by Asienreisender, 2012/2014. All the three areas are square shaped. Around the middle part is a wider space, aligned in a remarkable, differing pattern, which was dedicated to the commoners, animals and daemons. It's for those who stick to physical desires, who lead an unspiritual way of life. That's then, 'naturally' the commoners, who are not part of the elitarian classes. 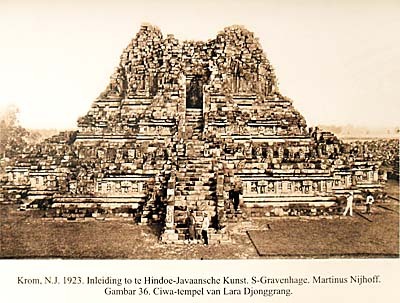 The boost of religious monuments came certainly along with a stricter hierarchical structuration of the ancient Javanese society. 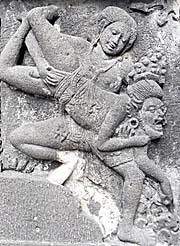 Servants in the bas reliefs of Prambanan. They are easily recognizable by their haircut. Numerous details are worked into the fresco. The building in the background looks like a simple dwelling. Although the nobles of the time are seen as rather modest leaders, their effort was doubtlessly to strengthen their authority. The medieval Javanese society became certainly (much) more hierarchical due to all the monuments and the rituals applied on them. The priest cast must have grown very much to keep all the temples in service. What did that mean to the peasantry? They still had to feed the growing clergy and nobility, and many must have been involved also in the hard work. The legitimation pattern of the ruling feudal class was their close relation to the divine beings and the interpretation of their 'will'. A king was king because the gods made him king (divine right) or, moreover, was himself anyhow godlike. And all the impressing buildings and the rituals served as a proof for their 'righteous' rule. As well as in Borobodur we don't find any hints for slavery in this culture; what does not mean there weren't slaves. In ancient times, when Prambanan was a living culture, there were certainly buildings and maybe housings of people in the outer area who had anything to do with the construction, maintaining or ritual functions of the sacred place. Since these buildings were made of organic materials, they are gone. Still, there should be traces left...?! Around the Prambanan temple compound are more temples in the wider area. Among them are even buddhist temples, as the 2 kilometer away Candi Sewu, still within Prambanan Archeological Park. 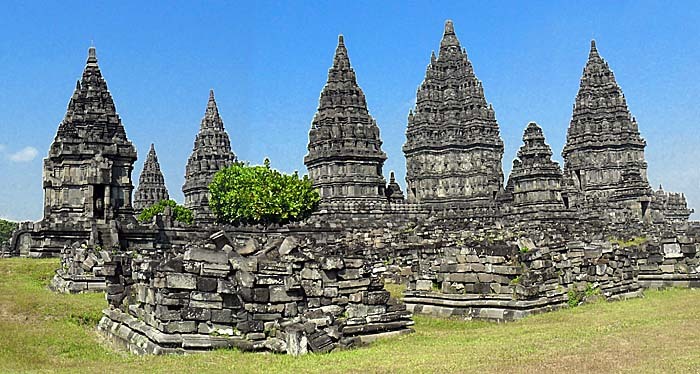 It is generally believed that the ruling dynasty who let the Prambanan temple complex built, was the Sanjaya. The Sanjaya dynasty was named after their first king Sanjaya, who established the dynasty in the early 8th century, and ruled the Mataram kingdom (also: Medang kingdom) in central Java. The Sanjayas established their rule before the competing Sailendras appeared in the region. Witness of the dynasty's founding father is the Canggal inscription, a stone stela found at the foot of Ukir (Wukir) hill on the southern Kedu Plain. 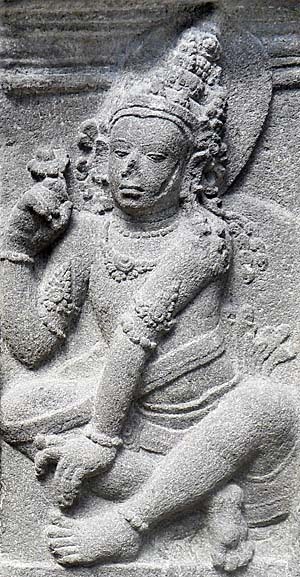 A Sanjaya nobleman in the bas reliefs of Prambanan. Who was the privileged man behind, who gave the model? However, it's not fully clear how the relationship between the Sanjaya and Sailendra dynasty has looked. The Sailendras came later to Java, and their origin is dubious. There are strong hints that the Sailendras were ruling the Srivijaya empire in south Sumatra and had originally roots reaching back to the empire of Funan, the first civilization in Southeast Asia. 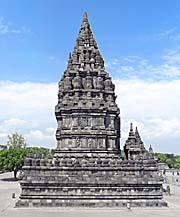 The Sailendras name and reputation is mostly related to the errection of buddhist Borobodur. However, it's possible that the Sailendras ruled over the Sanjayas, who were then merely a vassal of the Sailendras. There are no indications for much violent conflict between the two, and also religious struggle played seemingly no or merely a minor role. It seems that the Sanjayas overcame the Sailendras in the years around 850 CE, and were in the following decades the sole rulers over central Java. 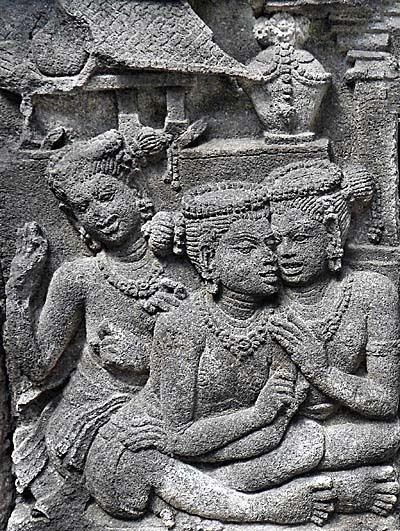 As a symbol of their reign the erection of Prambanan happened from 850 CE on. The ruling Sanjaya king of the time was Rakai Pikatan (reign: 838-850 CE). This king Rakai Pikatan was married to princess Pramodhawardhani, the daughter of king Samaratunga of the Sailendras. The princess is seen as the model of the statue of Durga Mahisasuramardini, placed in the northern chamber of the grand Shiva temple. She is seen as identical with Rara Jonggrang of the famous Javanese folktale (see below). It's also remarkable that the hindu Sanjayas didn't do any harm to the older buddhist monuments of the Sailendras like very nearby Candi Sewu. Their ambition seemed to have been competitive with the buddhist buildings and maybe even to overcome them in magnificence. But as a religion and a philosophical concept buddhism was, as it looks, not seen as a competitor to hinduism. Newer, alternative suggestions from Indonesian historians are that there was only one, the Sailendra dynasty, who ruled over central Java. The kingdom was called Mataram (Medang), and it's capital was in the Mataram area, north of Yogyakarta. Following this theory, Sanjaya and his offspring was part of the Sailendras. Sanjaya's son converted to Mahayana buddhism, what explains the two different religions in the area and the time. The whole era ended at the year 928, most probably because of natural disasters who caused the people of central Java to leave the heavily destroyed land what was under a partially several meters thick layer of Merapi's ashes. The court of the empire was moved then to east Java (929 CE) by the then ruling king Mpu Sindok (Sri Isyana Vikramadhammatunggadeva). The empire's name was changed then to 'Medang'. 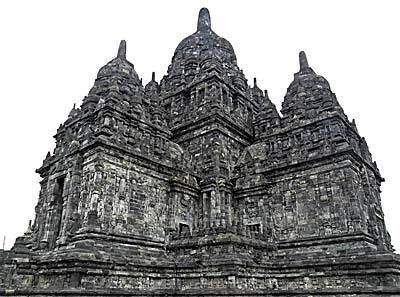 Sewu temple is one of many monuments of the Sailendras. Sewu is, like Borobodur, a Mahayana buddhist temple. Since we lack thorough information of the time and the key personalities of the time, it's a bit irritating to have at least two different, partially contradicting theories about the nobility of the time. However, it is clear that the Mataram kingdom was the dominating empire over larger parts of central and east Java. 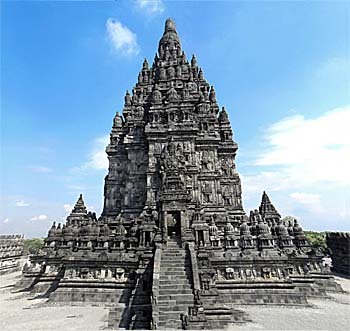 From it's foundation by king Sanjaya to it's extinction in east Java it spanned the time from 717 CE or 732 CE to 1006 CE, what is at least 274 years. 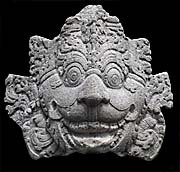 The first two centuries marked the developing of classical Javanese arts and architecture. The Mataram kingdom became more and more the rival of the hegemonic Srivajaya empire of south Sumatra. 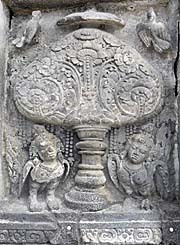 Impirial ornamentic at Candi Sewu. The Roman empire, the British empire, actually all the empires of the past produced a lot of state art. In the 19th century the western culture separated arts and industrial products into two branches. The centuries long livespan of the empire of Mataram marks the construction of thousands of temples throughout central Java. Beside Prambanan, Sewu and Borobodur there was certainly also a connection to the hindu temple city on the Dieng Plateau. Remarkable is the connection between the Mataram kingdom and the Khmer of the time. In the late 8th century the Sailendras led military expeditions into what is now south Vietnam and Cambodia. Sailendra king Samaragrawira (reign 800-819 CE) appointed the Khmer prince Jayavarman as a vassal governor of the Mekong Delta (the province was called then 'Indrapura'). Jayavarman, however, broke with the Javanese rule and moved the Mekong River upwards to the Tonle Sap Lake, where he founded the empire of Angkor in 802 CE. Further away now from the coast, where the Javanese ruled with their superiour navy, the new Angkorian empire had the back free do develop there another grand civilization with the constructions of famous Angkor Wat and Angkor Thom. The 'Stone of Sangguran', also known as the 'Minto Stone' is a 2m tall stone tablet which was placed in the year 928 CE by king Rakai Dyah Wawa in a place in central Java. In it's inscription it grants certain rights to the local ruler, who was apparently a vassal of the Sanjayas. There are also warnings inscribed addressed to those who would might harm the tablet. They are threatened with a number of physical punishments like nose cut, heavily beaten on all parts of the body, liver ripped, head split and more. The remarkable stone tablet was found in 1812 in the short time when Britain ruled over Java. 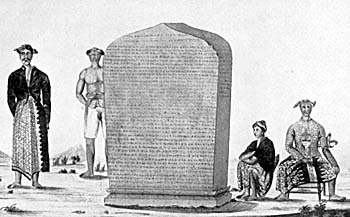 The then lieutenant-governor of Java, Thomas Stamford Raffles, sent the stone as a gift to his superior, the British governor-general of India (British East-India Company), Lord Minto. The tablet was brought then to the Minto family estate in Scotland. It's one of the rare sources of medieval Javanese history, and therefore Indonesia wants it back. The time of the Javanese rule over Indrapura in the southern Mekong region is also documented by a small temple building at Phnom Da near Angkor Borei. It's Wat Ashram Moha Russei, a small hindu temple, which represents apparently the architectonical style of the central Javanese monuments of the time. Unfortunately there are only few historical sources left. Historians can draw their conclusions from archaeological excavations of the many temples, namely inscriptions and reliefs at the temples themselves. A mere handful of stone inscriptions is left, that's stone stelas made by the kings who were often related to certain royal deeds, to dynastic lineages or announcing the foundation of a monument. There are some few witnesses of foreign diplomats, traders and pilgrims from India, China or of Arab sources. However, it's still all very gappy and does not give a whole, consistent image of the empire, it's dynasty (or dynasties), it's history and the whatabout of the monuments, neither of the life of the commoners. Once upon a time there were two kingdoms in central Java, Pengging and Boko. The first was ruled by a wise king who had a son called Bandung. The second was ruled by a cruel giant which name was Prabu Boko. Prabu Boko was a man-eater. Despite his unpleasant manners he had a beautiful daughter. Her name was Rara Jonggrang. 'Rara', in ancient Javanese pronounced as 'Roro', was a honouring title for a noble virgin maiden. 'Rara Jonggrang' can be translated as 'Slender Virgin'. Rara Jonggrang. Originally the statue is meaned to be Durga, one of the popular female hindu gods. She symbolizes perfection and is famous for having killed the buffalo daemon Mahisasur in the hindu cosmos. 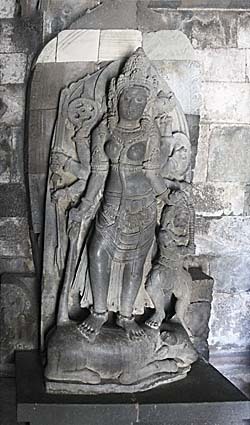 Her statue is placed in the northern side chamber of the main Shiva temple. The real, living model for the statue was supposedly Pramodhawardhani, the wife of Rakai Pikatan, the king who let built the temples of Prambanan. It's very probable that the highest representatives of the ancient culture set themselves a memorial in giving the gods their own physical traits. Prabo Boko now wished to expand his empire on the cost of it's neighbour and launched a surprising attack on Pengging. Fighting was hard and caused much devastation and a famine in both countries. At the climax of the struggle the king of Pengging sent his son, Bandung, to fight Prabo Boko. Bandung, who could perform supernatural powers, killed the evil giant in a dramatic fight. In a following attack Penggang's army captured Prabo Boko's capital and palace. When Bandung met princess Rara Jonggrang he was struck by her beauty and urgently wished to marry her. The princess, still in grief for her father's dead, stricktly refused. However, since her side lost the war, she was not in the condition to, and Bandung insisted on the marriage. So, Rara Jonggrang thought to trick him out by demanding two conditions: first, the prince must built a deep well with the name Jalatunda, and second that the prince has to build a thousand temples in only a single night. After Bandung finished the well, the princess could convince him to climb down into it. One of her allies, a giant as her father was, threw big stones then into the well to bury Bandung alive. With all his strength and his supernatural powers Bandung succeeded to escape the trap. He even forgave the princess her bad deed and started the second task, the temple construction. Prince Bandung relied again on his supernatural powers and went to work, calling numerous daemons to help him constructing the buildings. The princess therefore went with her servants to the east where they lit a great fire and started pouncing rice, indicating so the beginning of the next day. The roosters, who were fooled, cried out and prince Bandung's daemons, almost ready with their work and had built already 999 temples, left the site, abandoning the last temple unfinished. The prince, now realizing the cheat, cursed Rara Jonggrang and a spell of him turned her into a stone statue. 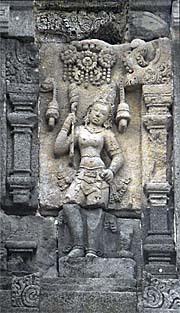 Put into the northern chamber of the thousandth temple (known as the Durga statue), Rara Jonggrang became herself part of it and was namegiving for the grand Shiva temple of Prambanan. The legend of Rara Longgrang contributes to the confusion about the rivaling dynasties of the central Java of the time. Is here the conflict between the Sailendras and the Sanjayas described? 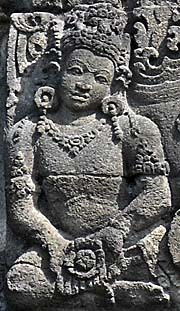 It is possible that prince Bandung was Rakai Pikatan, the Sanjaya initiator of Prambanan, while the giant king might be Samaratungga of the Sailendras. Rara Jonggrang then is Pramodhawardhani, Rakai Pikatan's wife and daughter of the Sailendra king. The legend of Rara Jonggrang might be the description of the final violent conflict between the two dynasties and their empires which led to the defeat of the Sailendras and their emigration back to Sumatra. 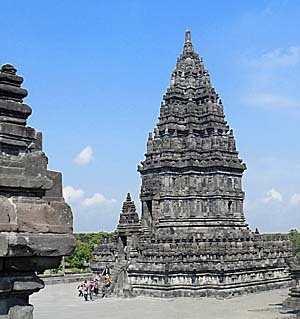 The Sanjayas then ordered the construction of the hindu Prambanan temple site to cement their power. Beautiful Rara Jonggrang has successors: photo shooting in front of Candi Vishnu. 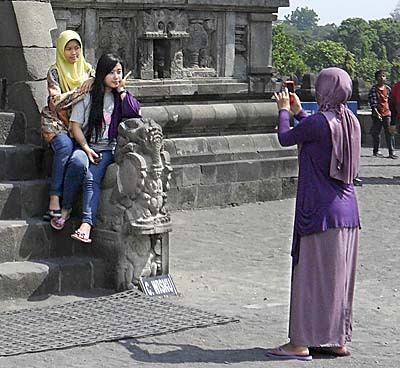 Southeast Asian tourists love, above all, having as many 'I was here' photos as possible. Being a tourist means showing status. One has to add that the legend of Rara Jonggrang was invented in the time when the Javanese court had moved already to east Java. Since history is mostly written by the victors, the legend sets the Sanjayas around Ratu Boko in the justice position, while the opponents appear aggressive, brutal, treacherous, partially as man-eating monsters. It could be also thinkable that, if the one-dynasty theory is correct, the Sailendras had internal strife and the dynasty broke apart, triggering a civil war. Ratu Boko is also a fortress not far away from the Prambanan site. It's very extraordinary to find a medieval fortress in Southeast Asia, for normally exclusively sacred buildings were built in stone. Morevover, at Ratu Boko there is a palace building and a crematory remaining. Archeological traces give hints that there was once a battle at Ratu Boko. Soon after the completition of the temples a mysterious depopulation of central Java also hit the temple city of Prambanan and the temples were abandoned. There were outbreaks of Mount Merapi and earthquakes in the years from 928 CE on. Prambanan's main Shiva temple Rara Jonggrang in the state of 1923. That's the result of the first restoration of 1918 and the following years. The photo was displayed in the Prambanan Museum. It is very probably that the heavy volcanic outbreaks led to the extinction of the central Javanese cultures of the age. In the years after 928 CE the court of the Mataram empire was shifted to east Java. Seems, central Java was kind of a 'no-go area', depopulated, by natural forces havoced land. Two of the fiercest earthquakes in 1549 and 1584 destroyed the temples almost completely. It was then widely forgotten for a time and by chance rediscovered in 1811. It's an interesting footnote of history that all the three most significant Javanese sights, Borobodur, the temple city on the Dieng Plateau and Prambanan, were rediscovered in the short time of British rule over Java (1811-16). The monuments were used as a quarry for building materials and roads. Dutch residents also took many sculptures for their private gardens and homes and made them lost for science. Scientific researches started at 1885, but the first systematical research was done in 1918. Main basic reconstruction and restoration began in 1937 and lasted until 1966. I really wonder how the archeologists managed to rebuild the buildings, for it was so deeply destroyed and no written witnesses about it's former structure existed. In fact the restauration is ever ongoing and still uncompleted. Besides, there are still earthquakes and Prambanan is hit again and again. The last big earthquake was in 2006, and the main temple is therefore still closed. Since 1991 Prambanan is a UNESCO World Heritage Site. Candi Sewu's temple dome. Candi Sewu is of a considerable size. The sight of Prambanan lies merely some 18km northeast of the city of Yogyakarta. It's easily possible to go from downtown Yogyakarta to Prambanan by one of the frequently running busses. The trip takes an hour and ends at the final bus station very close to the ancient site. The road to Prambanan is, by the way, the main road connecting Yogyakarta with Solo (Surakarta). Nearby the main site, still within the park, is a big open-air theatre. Hundreds of Javanese ballet dancers perform the epic story of the Ramayana on and around full-moon nights there in the dry season. In the further surroundings are many more temples to see. Still part of the large Archaeological Park of Prambanan are Candi Lumbung, Candi Bubrah and Candi Sewu, a buddhist monument. Spread over the wider surroundings are many more temples of the 9th and 10th century, as Candi Plaosan, Candi Sambisari and Kraton Ratu Boko, rather a palace and a fortified castle than another temple site. 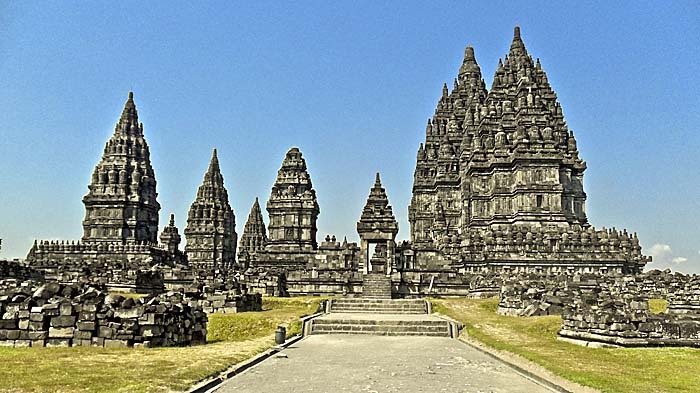 The geographical area of the temple monuments is called the Kewu Plain or also the Prambanan Plain. There are considerations to expand the protected area considerably, enclosing also the above mentioned temples and some more. The status of a sanctuary area would mean a stop for anymore new building activities within the aera. Candi Sewu with it's temple compound around. Sewu temple is older than the Prambanan group and it was a buddhist sanctuary. It is, although still within Prambanan Archaeological Park, a separate sight of a considerable size with formerly hundreds of side temples of various sizes. Most of them are, unfortunately, crumbled away. Candi Sewu is the one with the three visible domes in the middle of the picture. The (two) in the left of the image are side temples, and actually much slimmer than they appear here. The image is stitched together of three separate photos. Due to a later correction a distortion resulted.